The four years of blogging so far have not been all of a piece. I launched Rocketpunk Manifesto with the usual early burst of enthusiasm, which lasted about three months. After that my blogging started to lapse, until I was posting only an item or two per month - a total of 23 posts in 2008, only seven of them from June through year's end. Around March of 2009 I decided to try bringing the place back to life. I started posting more, and traffic, which had been running about 250 'unique visitors' per month, began to rise - especially after Winch of Atomic Rockets linked some particularly topical posts. Monthly readership grew about tenfold by last spring, and the comment threads started to take on a life of their own - something that has continued rather bumptiously. They have become a very large part of the overall value of this blog, for which I thank the commenters, both regular and occasional. I have no 'long arc' intentions here, though I will probably (and shamelessly) keep posting additions to the Space Warfare series so long as pandering to the taste for senseless death and destruction IN SPAAACE !!! continues to goose my traffic stats, as it consistently has. Apart from that, this blog will probably continue to waver, as it long has, between discussions of what might happen in space in the Plausible Midfuture, and what might happen in space in Romance, or at any rate the subgenre of Romance known as SF. The two, I suspect, will not have all that much in common. Space is filled with wonders, which we will continue to explore. But there is probably no more reason for people to settle there in large numbers than to colonize the slopes of Everest or the depths of the Marianas Trench. Many of you will disagree, often in the comment threads, something that has tended to add spice and vigor to this blog. But at least on the science fiction side of the balance my perspective leads to a curious paradox. What place do Realistic [TM] spaceships and other trappings have in settings that are fundamentally operatic, settings of Romance? The answer, as I see it, is essentially a matter of aesthetics. If a ship in a fantasy novel is magical anyway, it might as well be built out of bricks. But most of us would find that vaguely unsatisfying. The Rule of Cool prevails, but one of its subtler tenets is that truly Cool ships, swords, spacecraft, whatever, while they may not be exactly realistic, should at least look like they might be real. At least they should not look embarrassingly fake. The willing suspension of disbelief is supposed to be helped, not gratuitously insulted. D'Artagnan may live in the France of Romance, but his sword is sharp. So there remains a place for space warcraft (and peaceful trading craft, for that matter) that, however operatic in their implications, nevertheless look like products of a technology that once passed through the Plausible Midfuture, and learned there how to build and operate believable spacecraft. And I will continue to discuss them here. Along with whatever else I'm interested in and think you my readers might also be interested in. Yes, you've heard this before, but ... discuss. 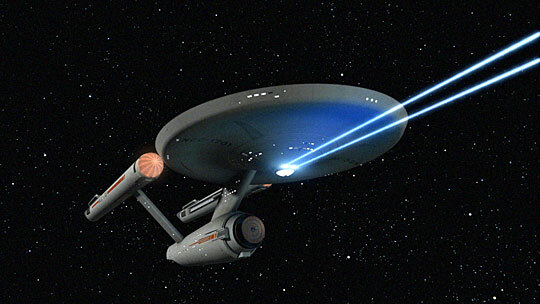 The image comes from this website - I have no idea whether it accurately portrays the TOS version of the Enterprise. But I remember wondering about the diverging phaser beams. Laserstars, as the term has come to be used on this blog, are military spacecraft designed to carry and deploy a single powerful weapon laser installation of the maximum practical aperture and power. In their 'ideal' form they would be drones, robotic in the broad sense that includes remote control from a separate command ship (or ground station, etc.). A couple of provisos are needed. In conceptualizing laserstars I chiefly have in mind classical-style lasers operating broadly in the optical band (IR through UV), whose beams are passed through telescope-style aiming and focusing optics. It is this telescope, more than the individual laser itself, that provides the distinctive feature of a 'laser cannon' - if the available power is more than a single laser can handle you could easily have an entire bank of lasers all firing through the same optical system. If you have lasers zapping in the far UV or X-ray bands, the aiming optics become quite different. My impression is that the main telescope becomes long and narrow instead of short and wide. In either case, however, the optical system of a laserstar is implicitly too big, relative to the whole spacecraft, to be mounted in some equivalent of a turret. Instead it is 'keel-mounted,' and gross aim is achieved by pointing the entire spacecraft toward the target. The general argument for all this is that the effective range of a laser is in linear proportion to the aperture of its optical system. Double the telescope aperture and you double the range at which the system can achieve a given spot size and zap intensity. But a further proviso is that the largest practical laser installation and optical system are in fact large enough that you can only conveniently mount one aboard a spacecraft that is itself of practical size for war service. If it turned out that the most cost-effective size for the spacecraft, with its drive engine and power supply, could carry half a dozen of the 'largest practical' laser optical installations, that is how many it would carry. Finally, a broader proviso is that a laserstar is not to be regarded as a 'space warship.' It is perhaps more nearly analogous to a railroad gun, deployed to a position where it can make use of its long range firepower while being supported by other spacecraft. In spite of the image at the top of this post, I don't see laserstars primarily engaging in combat in low orbit around a planet, but rather at the outer edge of a planet's strategic envelope, either defending it against attack from elsewhere or maintaining a blocked by cutting off communications with or relief from elsewhere. Precision and the battlefield don't mix. There is a lot of precedent for the general observation that pinpoint accuracy is hard to achieve amid the turmoil of combat. On the other hand, in the contemporary era precision-guided munitions have demonstrated capabilities that would have startled military observers of an earlier era. And laserstars are not a rock & roll weapon, which is why I wouldn't expect to see them in action in (relatively!) crowded planetary space. They are long range artillery for use against targets that must travel through deep space. Monocultures are vulnerable. This principle of ecology also applies to warfare: Dependence on one weapon generally makes you vulnerable to an enemy who can make use of several. A laserstar by itself is indeed dangerously inflexible. In its 'pure' form it would be deployed only in a constellation containing other spacecraft and weapon systems. In other situations I would expect to see only partial application of the laserstar concept - for example, I suspect that multi-mission military spacecraft (broadly 'cruisers') would carry a single big keel-mounted laser mirror, for long range zapping power, while also carrying a few smaller mirrors, along with kinetics, for fighting in more chaotic environments. And, of course, having said this, in any given setting it is plausible that things have worked out otherwise. Laserstars or their like may have no place in the order of battle, for perfectly credible reasons ranging from inability to combine extreme steadiness with extreme power levels, to a power-political environment in which the ability to zap things at 30,000 km has no military significance. Space armadas have no place in the plausible midfuture anyway. On this point I plead guilty; significant military operations beyond Earth orbital space are an inherently operatic concept, only to be expected when there are substantial human populations, strategic assets, and even polities scattered across space. This point has a couple of sub-implications. Since we are somewhere beyond the plausible midfuture anyway, techlevels are presumably higher, especially propulsion performance and thus the ability to sling kinetics. A subtler argument also stems from being beyond the 'plausible midfuture:' A civilization with colonies and space armadas has evidently solved the problem of sending large numbers of people into space - weakening the argument for automated spacecraft as against human crews. The specific response to these points would be that higher techlevels presumably apply as well to lasers and automation. But really this aspect of the debate takes us into an issue broader than just laserstars, namely the balance of technology and the flavor of technology in space-operatic settings. I used to have an SF paperback that featured, among other things, a reconditioned World War II heavy cruiser armed with smoothbore muzzle-loaders. This combination was justified by a post-apocalyptic setting, but in general we want our future technologies to have an internally consistent techlevel, or at any rate feel as if they do. What constitutes this internal balance is itself, of course, a matter of speculation. Also, if you are a regular reader of this blog you probably have a bias toward 'realistic' space technology, in a sense that is as much aesthetic as strictly technical. 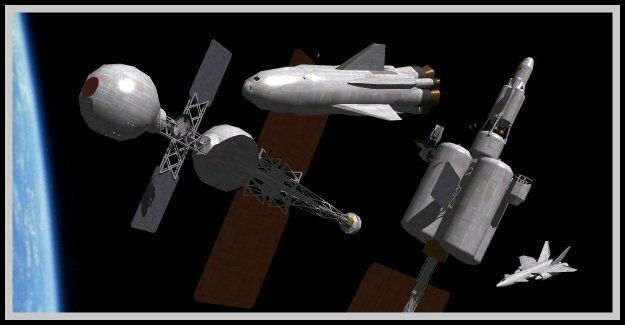 Roughly, you want spaceships that are broadly recognizable as industrial products - at least descended from the plausible midfuture, even if that era has become the plausible mid-past. I will deal further with this subject (but not necessarily laserstars) in upcoming posts. Via Atomic Rockets, this Martin-Marietta concept for an orbital laser ABM platform gives the general impression of a laserstar, but is already notably retro - probably of 1980s vintage. We'll delicately ignore the visible-in-space beam. In the following 50 years a total of 517 people have traveled into space, using the international definition of space as beginning at an altitude of 100 km. Outer space has turned out to be a difficult environment for us. It is costly to reach; living there requires extensive and specialized life support; and prolonged exposure to space conditions, especially microgravity, is debilitating to human beings. The optimistic speculations of Arthur Clarke, among others, that living in space would be healthful proved (alas!) to be quite wrong. On the other hand, what we have learned since Yuri Gagarin's single orbit 50 years ago is that humans can live and work in space. This, let us remember, was by no means a given. Until he came back to Earth alive and well, no one could be sure that humans could safely travel in space even for 90 minutes, let alone 180 days. Heart failure or deterioration, brain damage, grave psychological disorientation, were all on the table. They might make human spaceflight fatal or unacceptably dangerous, or simply render it hopelessly unproductive. Yuri Gagarin's flight began to show us that none of these was the case. Not only can we travel in space, without excessive ill effects, for a period of months, but we can do work there. We have judgment enough to operate and maneuver spacecraft, and - even encumbered in space suits - dexterity enough to maintain and assemble them. Doing Cool Space Stuff is very difficult and extremely expensive, but it is not impossible. It is not (yet!) obvious that there are things we can do in space better by sending people up there than by sending up only our machines. So far, the only thing that human spaceflight is uniquely capable of doing is demonstrating the possibilities of human spaceflight. But there is sufficient interest, and thus sufficient political and economic support, that we will continue to send up modest numbers of space travellers in Yuri Gagarin's footsteps. Over time we may find new reasons to send up people in more than modest numbers. Gagarin's flight also accomplished something else that is worth mentioning on this blog, on which I spend a fair amount of time talking about blowing stuff up in space. If the Space Race of the 1960s accomplished nothing else, it gave Americans and Russians of that era a way to flex their muscles and beat their chests without resorting to fighting. This was an extremely good thing. Much as I indulge talking about it here, warfare is a bug, not a feature. Meanwhile, here's to 50 years of human spaceflight. Poyekhali! 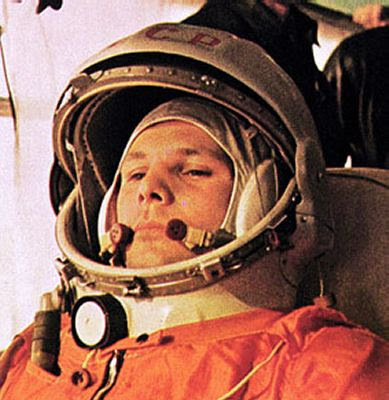 The image of Yuri Gagarin comes from this space oriented website. 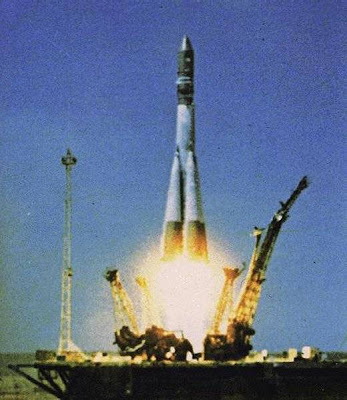 From another space site comes this image of Vostok 1 lifting off. At 100 kilometers per second, any object - be it a depleted-uranium slug, a carton of skim milk, or a throw pillow - packs kinetic energy equal to 5 gigajoules per kg, equivalent to 1195 kg of TNT, rather more than a ton of bang. In space the bang will be soundless, but it will still hurt. 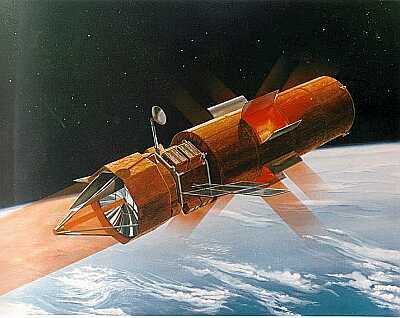 1 - Missiles in space have effectively unlimited range, more than even Ravening Beams of Death. 2 - If you have the space technology to put large numbers of people in space, you pretty definitionally have the capability to throw lots of luggage, and throw it fast. 3 - There is reasonable scope for tactical maneuver in kinetics-dominant space combat, something that (it seems to me) is much harder to get in laser combat. You may note that these three justifications are ranked by increasing meta-ness. The first is a general consequence of space speeds. The second hints at future history. Any spacefaring society on a grand enough scale to have grand space battles has put generations or centuries of major effort into its overall space technology, whether its past has been peaceful or warlike. Long range lasers probably have more limited and mainly military applications. (Extensive use of laser propulsion does change this equation.) As a point of comparison, in the 19th century military technology tended to adopt new civil technologies, rather than being a primary driving force in itself. The third point is most shamelessly meta. The people who fight wars are not concerned to make them interesting; that is only of concern to people inventing them in order to write about them. Thus my picture of kinetic space warfare was kinetic in style as well as in weaponry. My starting point was the observation that if two ships are armed with similar-performance missiles, the more maneuverable ship has a crucial advantage. It can (at least in principle) maneuver to evade an enemy's missile, while the more sluggish enemy ship cannot quite evade its own missile. Multi-ship tactics also look potentially complex - and therefore interesting. Ships maneuver like (3-D, vector) polo ponies to line up shots at opponents while avoiding the enemy's shots. The worst position a ship can be in is dynamically surrounded, so that a burn that carries it away from one enemy's missile envelope takes it right into another's. The second worst position a ship can be in is to make a burn that accidentally carries it out of the fight at the point of decision, allowing the enemy to defeat its consorts in detail. Lasers, in my vision, were purely secondary and defensive, intended for last ditch defense against incomings. There was a serious question in my mind whether a defensive laser armament was even worth carrying - the extra mass of a laser battery would mean reduced missile firepower, more sluggish performance, or both. In this thumbnail description it sounds much like space fighters dogfighting, though the scale of the thing was such that battles would unfold over hours or days, even weeks. I have not put any numbers to all this, except for the ones I gave at the very beginning, implying combat encounter speeds on order of 100 km/s. When I first came up with this image of space battles my assumptions were EXTREMELY operatic, as in photon drives with multi-g accelerations. Eventually I worked my way down to mere fusion torches in the low terawatt range. A variety of holes, of various gauge, can be punched or burned through this vision of space combat, but it still represents one variation on the theme of what we all want for story purposes, Cool Space Battles. I eventually abandoned this conception. Not because the propulsion was still operatic even in its later, more modest forms - any setting where you have space battles at all, other than near-Earth encounters in a primarily terrestrial war, is at least demi-operatic. But I came to suspect that the laser assumptions I was making were conservative out of all proportion to the propulsion assumption, yielding the equivalent of ships with gas turbine engines and smoothbore muzzle loaders. By no means is that certain to be the case. Lasers and space propulsion are not inherently linked technologies (though under some assumptions they would be). And there is plenty of experience to show that battle performance of weapons often falls short of bench test performance, sometimes dramatically so. But I came to feel that it was special pleading to assume as much, and ended up with laserstars, as I have described them in prior installments of this series. At some future point I might change my mind again. 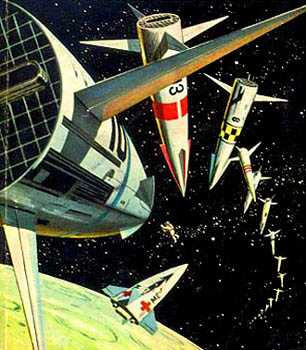 The somewhat retro image is from Atomic Rockets - read also the discussion on the linked page.